In 2011, 43-year old Snoop Dogg, real name Calvin Broadus Jr signed a three-year deal to be the face of Blast, a fruit-flavoured drink that was part of Pabst's Colt 45 malt beer range. Under the terms of the agreement he was paid around $250,000 and further instalments of $20,000 for every tenth mention of the brand on social media, at concerts or during TV appearances. But he believed his contract also entitles him to a portion of the sale price should Pabst sell the business before January 2016, as well as royalties on each case of Blast that was sold. Consequently he is seeking 10 per cent of the net sales price paid to Pabst for its Colt 45 malt beer line, which was included in last year's sale to beer entrepreneur Eugene Kashper and an investment firm, so he is suing American beer company Pabst, claiming he is owed money from its sale last year. 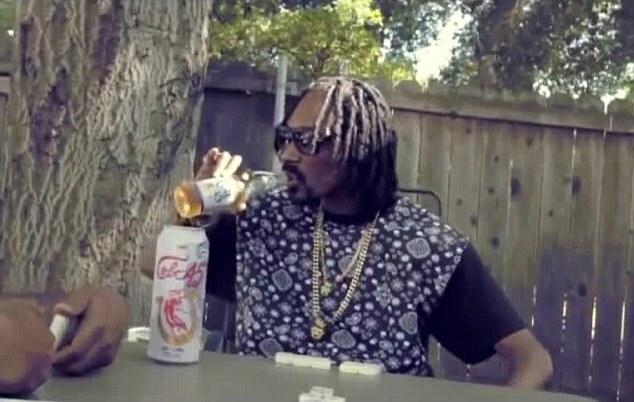 Pabst wrote in a statement that it had not been contacted by Snoop Dogg or his representatives about the proceeds and cited the company's new management. 'We are investigating the matter and would be happy to talk to Snoop or his representatives to try to get to the bottom of this,' the statement said. The lawsuit states Pabst told the rapper that the sale didn't trigger the clause entitling him to sale proceeds. The deal to sell Pabst to Kashper and San Francisco-based TSG Consumer Partners LLC was finalized in November. No purchase price was announced, but the lawsuit filed by the rapper's attorney, Alex Weingarten, states Pabst was reportedly sold for $700 million. It is unclear how much of the sale price was for the Colt 45 line of beers.